The Razor Blade Co. prides itself in only selecting the most meticulously crafted razor blades for our customers. Our razor blades come from handpicked sources in the United States, Latin America, and Europe. We ensure only the best materials and processes are used in order to guarantee quality in the thousands of blades sold every day. 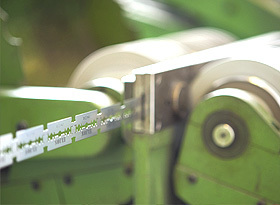 Razor blade manufacturing is an intricate process requiring several stages and treatments to create the perfect blade. Once the high quality carbon steel or stainless steel has been selected, the metal needs to be hardened so it will hold a sharp edge. The metal is placed into furnaces and subjected to heats above 2,000 degrees Fahrenheit in a controlled setting to avoid oxidation. The metal is then placed into a freeze chamber with temperatures reaching -100 degrees Fahrenheit. The metal is heated one last time in order to temper it; tempering is a process that adds elasticity to the brittle metal. Each step of the hardening and tempering process must be preformed to exact standards every time, or the blade will be compromised. The next step in manufacturing razor blades is to grind the blade to create a sharp edge. Again, the grinding is preformed in a series of stages, each time subjecting the blade to a finer grinding wheel in order to get the perfect sharp and durable razor blade tip. The blade thickness is also carefully controlled. We sell razor blades with thicknesses as small as .004” to .025”, and every millimeter in between. Blades of the exact same shape and design are featured in slightly varying thickness to provide more exact or fine cuts compared to heavy duty uses. Blades can also receive coatings at two different stages during the manufacturing process. Before sharpening, the blades can be coated with special hardeners that also make the blades smoother for shaving and trimming purposes. Finally, coating can be applied at the completion of the sharpening stage in order to again provide smoothness and reduce friction in cutting. Coatings can also protect against rust.